Federal and state workplace laws need to be conspicuously displayed so that your employees can readily see them (U.S. Department of Labor). There are a bunch of these laws that need to be posted in the workplace. You can print them all out for free from Federal and State government resources, or just buy a poster online that has all the up-to-date information compactly displayed. You will also want to consider purchasing Spanish-language labor law posters if you are a business owner in Arizona, California, Florida, Georgia, New Mexico, North Carolina, New York, North Carolina and Texas because those States make at least some regulatory requirements for posters to be displayed in Spanish-language when more than 5% of the workforce uses English as a second language (Source). 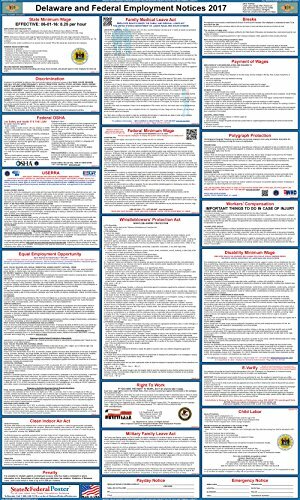 The posters below compile all of the Federal and State-specific labor law information into one handy, laminated employee law poster for. Which is a lot less messy than printing out tons of legalese and tacking it up on the wall. 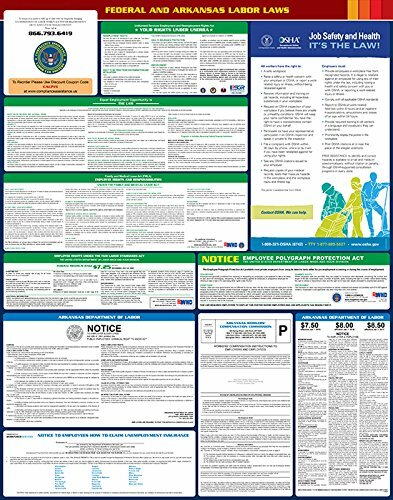 These labor law posters are State and Federal compliant, protecting your business from fines and employee disputes. They include State-specific updates for the current year plus all mandatory Federal postings. The United States Department of Labor provides an online poster adviser so you can double-check that the posters provide adequate Federal coverage for your business. For State-specific requirements, you'll want to connect with your local State Department of Labor to get up-to-date information about your state's specific posting requirements. Use this navigation table below to find your State-specific labor law poster. *make sure when you buy the poster that it’s the current year! This Alabama labor law poster by labor Law Center Official is State and Federal compliant, including a variety of updates. 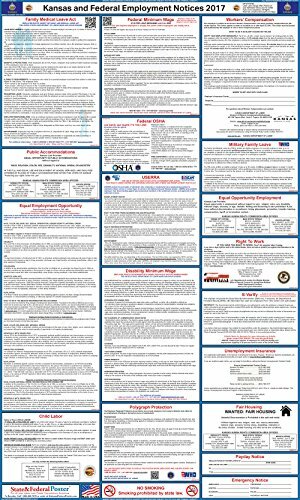 It includes EEOC information, Workers Compensation information pertaining to the State of Alabama, Alabama Child Labor Law info, Pay Day notice information, anti-discrimination notifications, withholding status info, Family and Medical Leave Act information, all within a 25" x 39" poster. The manufacturers, Labor Law Center Official, guarantee that you will be 100% compliant using this poster for Alabama business owners. 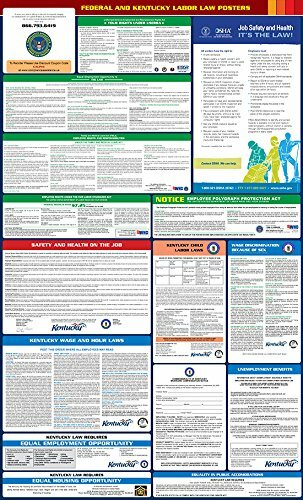 One buyer we spoke with said that these are durable and inexpensive laminated labor law posters that work any variety of different locations, whether they be on or off job sites. This State and Federal labor law poster for Alaska is laminated and measures 24" x 40". The manufacturers, labor law posters, say that their posters provide all of the mandatory Federal, State and OSHA (Occupational Safety and Health Administration) posting requirements to keep you in 100% compliance. Indeed, they say that their posters have been vetted by Alaska-area attorneys to ensure that when you post them that all the information contained is accurate for Alaska-region employers. You can always use the United States Department of labor first step poster adviser site to double check whether the posters truly a capture all of the required information you need to post. 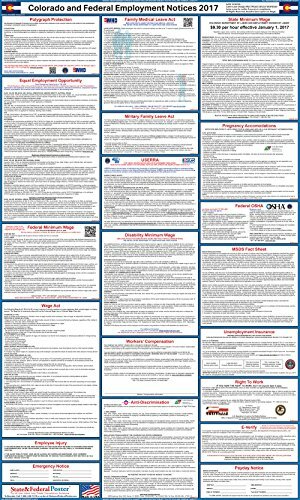 This State and Federal labor law poster for Arizona is a laminated option that measures 24" x 40" and is approved by OSHA and Arizona-area attorneys to provide organizations protection against employee lawsuits. One buyer we interviewed had commented how difficult it was to find laminated posters specific to Arizona law. He says that this is a quality and inexpensive option that provides solid legal protection. 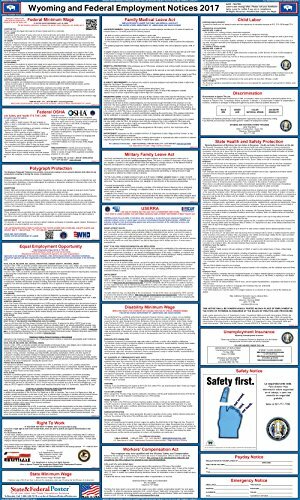 The Arkansas State and Federal labor law poster is manufactured by Compliance Assistance and measures 24" x 28", providing Federal and State information in one compact poster. On the Federal Labor law side, it covers Equal Employment Opportunity, Federal Minimum-Wage, Uniform Services Employment and Reemployment rights act, OSHA job safety and health protection requirements, Family and Medical Leave Act information, pay day notice info, IRS withholding notices, anti-discrimination notifications and Employee Polygraph Protection Act info. Specific to Arkansas State labor law requirements, they cover Minimum Wage, Worker's Compensation, Chemical Right-To-Know, and Unemployment Insurance information. 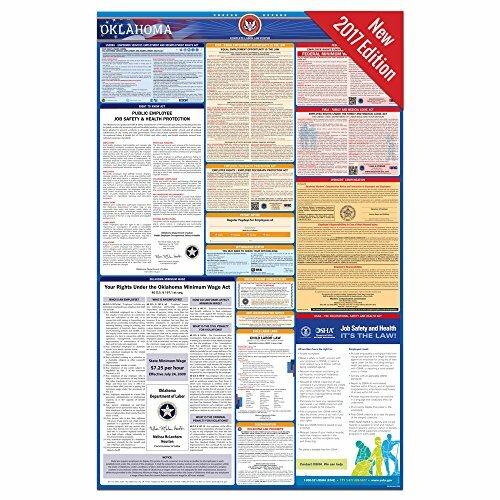 This 24" x 40" laminated California State and Federal labor law poster is designed to provide maximum protection for organizations and employers against labor lawsuits. It helpfully contains all of the California State and Federal required postings in one place including such specific information as Family Care and Medical Leave and Pregnancy Disability Leave information. 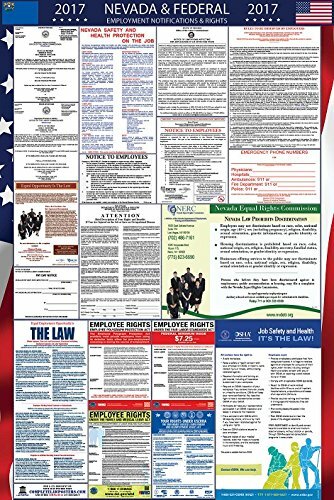 One buyer we spoke we have commanded this CA State and Federal labor law poster for providing all of the crucial legal information required for large and small California businesses in a compact and inexpensive package. Always make sure to double check that the poster you receive is truly up-to-date, and in compliance with the United States Department of Labor requirements- remember you can always check out their first Poster Advisor resource to ensure that your poster has all of the compliant information in it. The Colorado State and Federal labor law poster is a laminated option that measures 24" x 40". 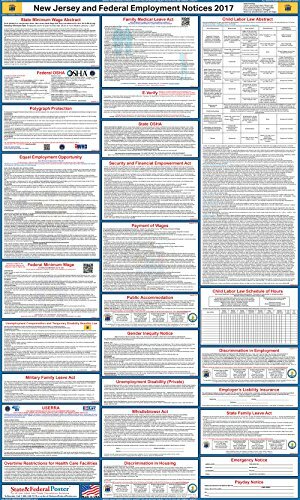 As with the other posters that we examined, it provides the mandatory Federal, State and OSHA posting requirements, along with important State-level information for CO. Remember, you could always check online against the United States Department of labor to ensure that the poster you have purchased truly meets all of the required Colorado employee law posting requirements. 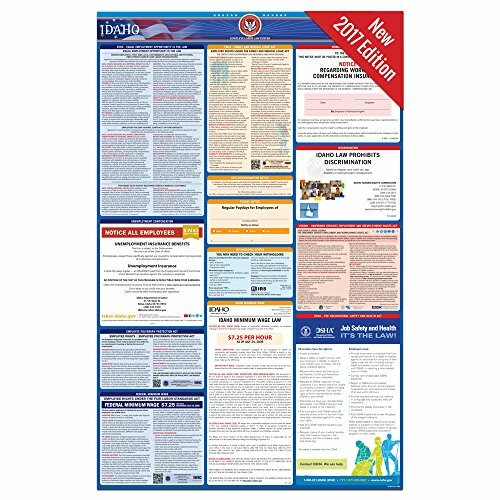 This Connecticut Federal Employment notice poster for is a 24" x 40" laminated labor law poster that helps provide the required notifications for small, medium and large Connecticut businesses. 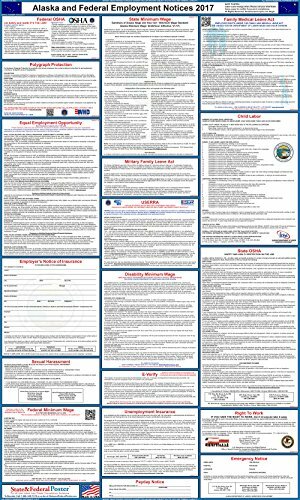 This laminated Delaware and Federal Employment Notices poster is an inexpensive option that protects businesses and ensures they are in compliance with both Delaware State and Federal law. The manufacturer, Labor Law Posters, provides a 30 day money-back guarantee and says about their posters are vetted by lawyers familiar with both the Federal and Delaware-specific laws. 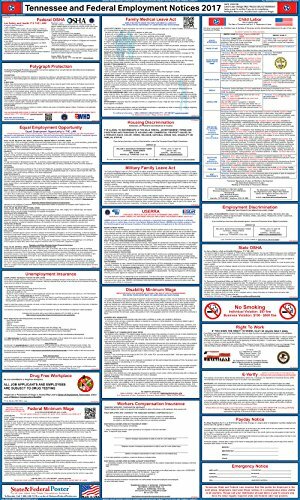 This Florida State and Federal labor law poster is a laminated option that measures 24" x 40"- designed to provide your FL business protection against employee lawsuits. It compactly disseminates up-to-date and accurate information about Florida employee rights. 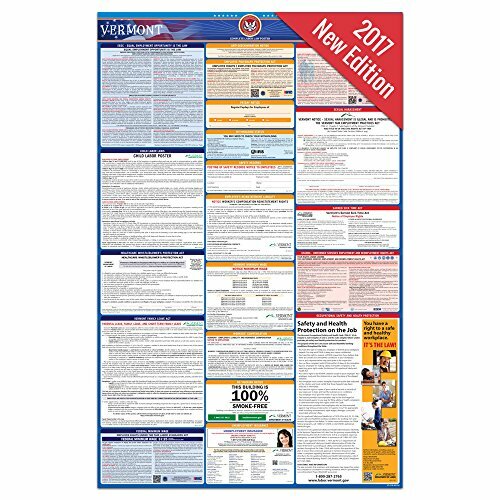 Buyers we spoke to, who were in the habit of purchasing these Florida labor law posters on a yearly basis, say that they are a compact and inexpensive way to provide them the needed legal coverage for Florida-area employers. This Georgia labor law poster is a State and Federal compliant infographic. It is laminated and provides all of the Federal and Georgia-specific information required to be in 100% compliance. It's important to remember, that you will need to purchase a labor law poster in Spanish only if more than 5% of your employees use English as a second language. If you meet that criteria, remember that this requirement applies to Texas, New York, North Carolina, New Mexico, Georgia, Florida, California and Arizona. When it comes to the number of posters that you will need, because the State and Federal Employment Notice is required to be accessible to all of your employees on a daily or regular basis, you will need to post them in an area that meets this criteria. This means, that you oftentimes will have to purchase multiple posters and install them in different areas to make sure that your employees have regular and daily access to the information. This Hawaii and Federal Employment notice is a laminated option that measures 24" x 40". It contains all of the Hawaii State and Federal posting requirements in one compact solution. Always make sure to double check that the Hawaii labor law poster you receive this in complete compliance with the United States Department of Labor you can do this by checking out their online resource the FirstStep PosterAdvisor (link at the top of the page). This online resource is engineered to help Hawaii employers and large businesses to remain in compliance with the laws that are administered by the Department of Labor. That said, you will always want to connect with your State Department of Labor to get accurate and up-to-date information about posting requirements for your specific State. This Idaho Labor law poster is a State and Federal compliant document- it is laminated and measures 25" x 39". It covers basic Federal requirements as well as Idaho-specific legal information for employees including discrimination information and the Idaho minimum wage law. Remember, that the Federal, Idaho State and OSHA labor law posters need to be installed in any workplace where there are one or more employees. As a ID business owner, it is your obligation to make sure that all of the poster information is up-to-date, meaning that you often need to purchase new posters whenever information at the Federal or Idaho State level changes. 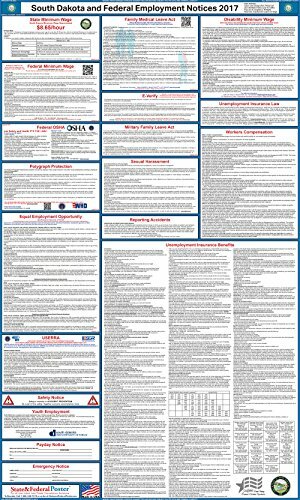 This 24" x 40" laminated Illinois State and Federal Labor law poster contains all the information you need to remain in compliance with State, Federal and OSHA posting requirements. 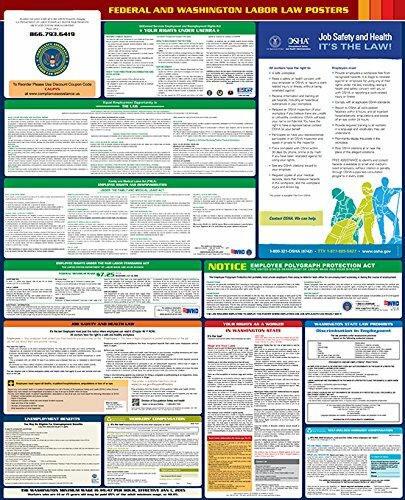 Looking over the poster, you can see information relevant to both the Federal and Illinois State level, including legal information pertaining to the Military Family Leave Act, Equal Employment Opportunity, State Minimum Wage, Emergency Care for Choking Victims, Disability Minimum Wage, Polygraph Protection, day and temporary Labor, Payday notices, Emergency Notices, Right to Work, Worker's Compensation and more. Buyers we spoke with were on the whole very happy with this Illinois Labor Law poster, saying that it provides all of the information they needed as IL business owners to protect themselves from lawsuits. 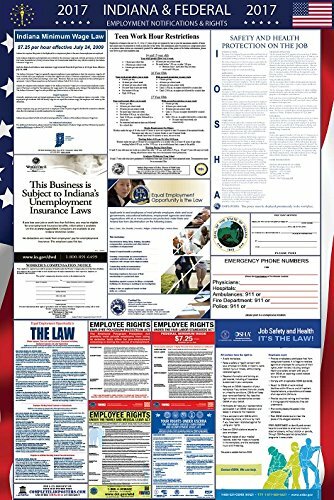 The Indiana State and Federal labor law poster is a laminated option that measures 26" x 39", it includes all of the federal updates from 8/1/2016. This poster helpfully outlines all of the official and mandatory federal labor law and Indiana labor law information to meet obligations that are required by the Department of Industrial Relations as well as other federal and Indiana-specific posting requirements. It provides colorful legal information regarding the Minimum Wage, IOSHA Safety And Health Protection, On The Job Workers’ Compensation, Emergency Phone Numbers, Pay Day Notice, Unemployment Insurance notices, Equal Employment Opportunity info, and all of the important Indiana-specific labor law info you need to display for your businesses employees. The Iowa and Federal Employment notices poster is and up-to-date Labor law poster that measures 24" x 40". 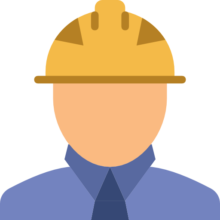 It covers all of the mandatory Federal, State and OSHA posting requirements so that as a Iowa-State employer or business owner you are meeting all of the legal State and Federal obligations. 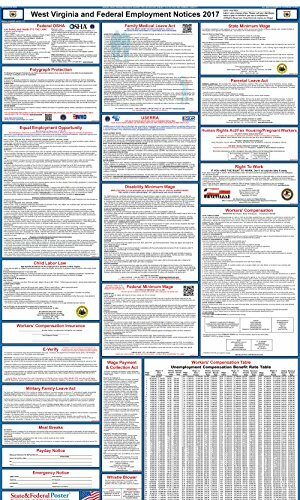 The Kansas Federal and State Labor law poster is a 24" x 40" option for your Kansas-area business. One buyer we spoke to had purchased this Kansas Labor law poster after realizing that their old poster was actually 4 years overdue for replacement. No one had taken the time to examine it and as a result they had been unprotected for a number of years- luckily nowadays there are some inexpensive Kansas Labor law posters online you can purchase to quickly meet State and Federal Labor law posting requirements. 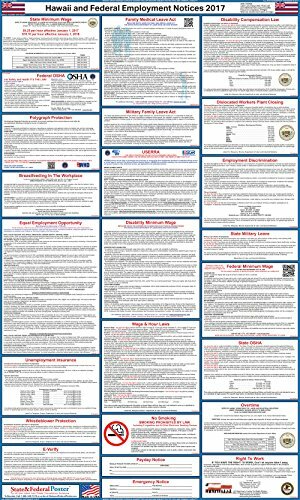 The Indiana and Federal Labor law poster is a laminated option that measures 26" x 39", it includes all of the Federal updates from 8/1/2016. This poster helpfully outlines all of the official and mandatory Federal Labor law and Indiana Labor law information to meet obligations that are required by the Department of Industrial Relations as well as satisfying other Federal and Indiana-specific posting requirements. This Louisiana, State and Federal labor law poster is a laminated option that measures 24" x 40". 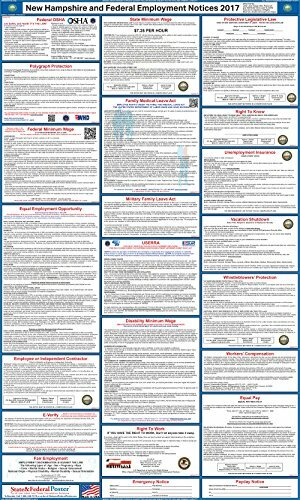 The legal information contained in this Louisiana labor law poster will help ensure your compliance with Louisiana State and Federal regulations, making sure that you avoid painful fines or labor disputes as a result of incorrect postings. The Maine State and Federal labor law poster is manufactured by Compliance Assistance. It is a 24" x 40" poster that provides a compact and colorful display of Maine's State and Federal labor laws. Specifically, Maine State labor law requirements are provided for sexual-harassment, Minimum Wage, Unemployment Insurance, Video Display Terminal Law, Equal Employment Rights, Child Labor laws, Worker's Compensation and Regulation of Employment. The Federal labor law requirements include Equal Employment Opportunity, IRS Withholding Notice, Payday notice, anti-discrimination notices, Family Medical Leave Act, Employee Polygraph Protection Act and OSHA Job Safety and Health Protection. As we have noted before, it is necessary if you want to remain in compliance with State and Federal laws, to post these posters throughout all of your work sites so that they are easily visible by your employees. 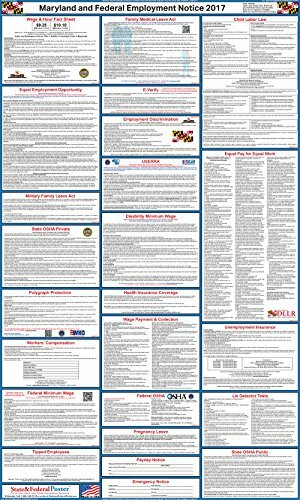 The Maryland State and Federal labor law poster is manufactured by Labor Law Posters and it is a laminated option that measures 24" x 40". 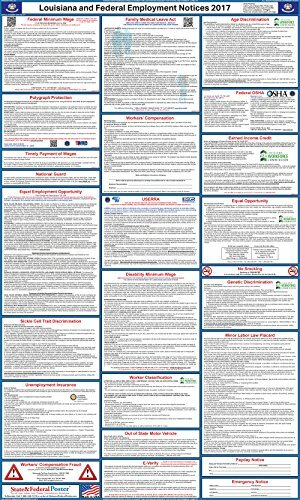 Maryland reviewers we spoke to were impressed by the extent of information contained in the poster and that it covered all the bases they needed as Maryland employers to remain in compliance with State and Federal labor laws. The Massachusetts labor law poster is manufactured by Labor Law Center Official. 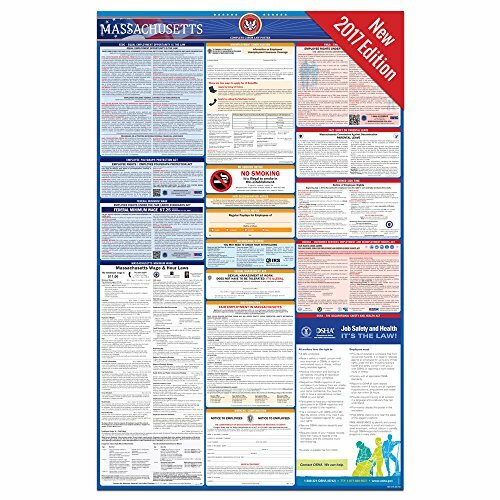 It is a laminated, 25" x 39" poster for the State of Massachusetts spelling out accurate and up-to-date Federal and State labor law information. Important for Massachusetts, this recent poster includes the Earned Sick Time and Minimum Wage updates as well as Federal revisions from 2016. Remember, that you will need to purchase more than one of these posters if you have workers who are not reporting to a central location on a regular basis. You'll then need to make sure these posters are displayed at those remote MA work sites so that they are easily and readily available to be read by your employees. 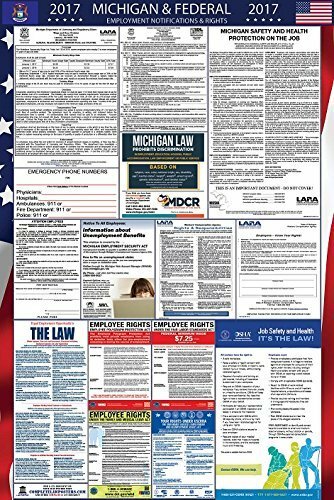 The Michigan Federal and State labor law poster is a 26" x 39", color poster that includes all of the required Federal postings as well as Michigan-specific labor law information, including the 2017 Michigan Minimum Wage. While some MI buyers thought that it was a little bit pricey, the poster does contain all of the up-to-date and accurate information you need to remain in compliance with both Michigan State and Federal government agencies. 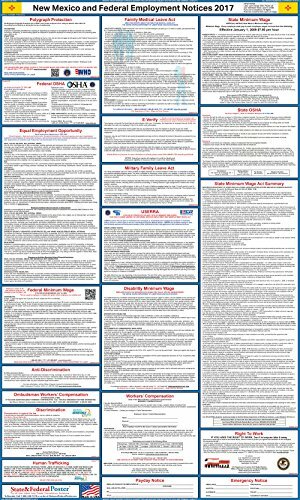 The Minnesota labor law poster is a laminated, 25" x 39", complete regulatory resource that provides accurate and up-to-date Federal and Minnesota State labor law posting information for your Minnesota business. This Minnesota labor law poster also includes important updates to Minnesota's Minimum Wage and Leave of Absence/Parental Leave Rights. 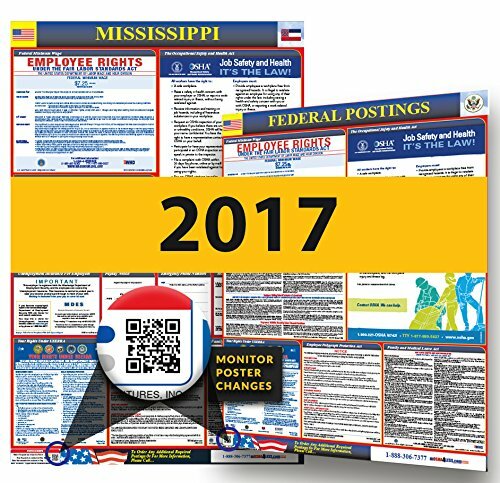 The Mississippi Federal and State labor law poster is a 24" x 40" color and laminated poster design to protect your business from employee lawsuits. This Mississippi employee law poster is uniquely designed to include a QR code to help you ensure that you can monitor poster changes with your smart phone. 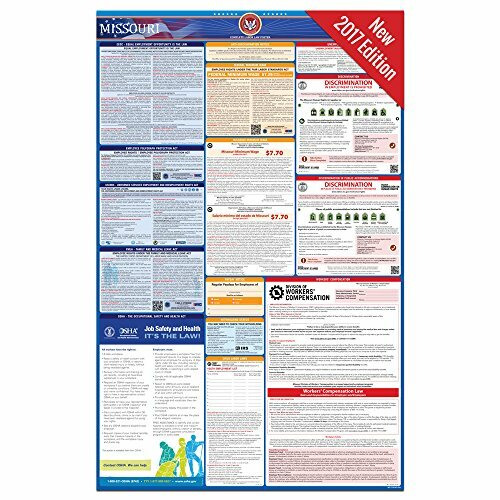 The Missouri labor law poster is a laminated option that measures 25" x 39" and is designed to be an all-in-one resource for Federal and Missouri State labor law posting requirements. It is manufactured by Labor Law Center Official who says that this is an attorney-vetted labor law poster guaranteed to keep you in 100% compliance. One Missouri buyer we spoke with told us that this was a vibrantly colorful poster with a waterproof laminate that made sure it withstood a year's worth of wear on the wall before they had to update from 2016 to 2017. 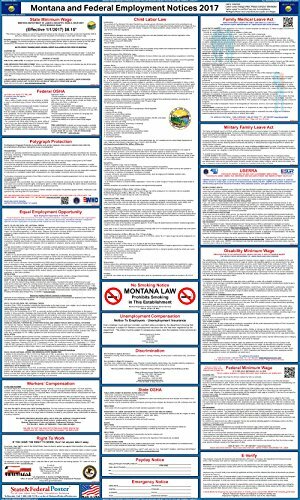 This Montana Federal and State labor law poster is a laminated infographic that measures 24" x 40". This poster is designed to ensure that Montana-State employers and organizations maintain their regulatory Federal and State compliance. The Nebraska Federal and State compliant labor law poster is a laminated wall hanging that helps to protect business owners and employers from employee disputes and posting fines. The manufacturer, Labor Law Center Official, guarantees that you will be in 100% compliance hanging this Nebraska worker law poster on your wall- though you will have to hang a bunch of them if you have a decentralized work environment. This poster includes updates from Nebraska's recent revision to their Minimum Wage and Equal Employment Opportunity Act. The manufacturer say that their labor law posters hang in many Nebraska area businesses, including restaurants, retail locations, and professional service environments. 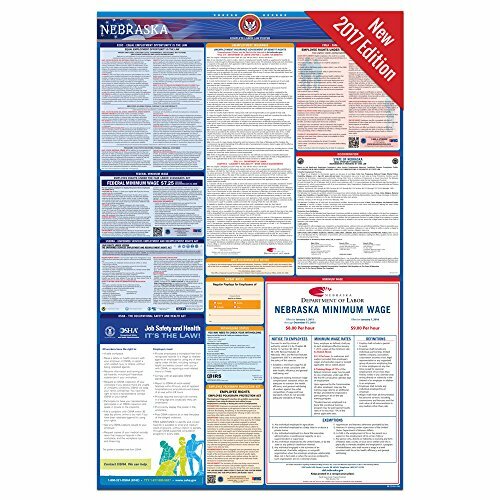 The Nevada State and Federal labor law poster is a 26" x 39" laminated poster that incorporates Nevada's recent minimum wage revisions in addition to required Federal labor law information. 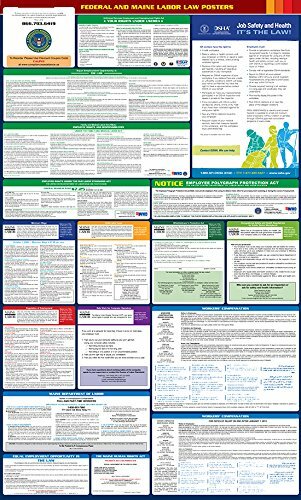 The New Hampshire Federal and State labor law poster is a 24" x 40" laminated wall hanging. 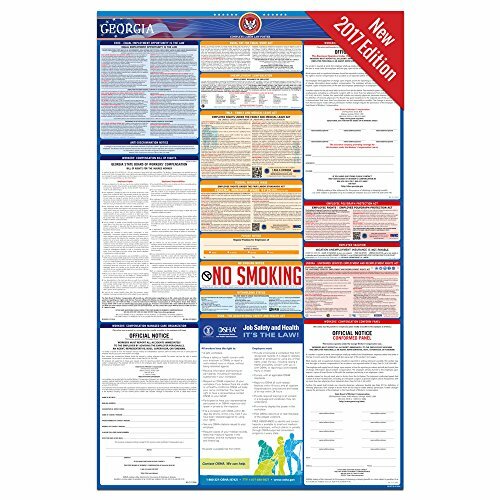 It is designed by Labor Law Posters and they guarantee that if you purchase you will be in complete compliance with Federal and the New Hampshire State labor law posting requirements. 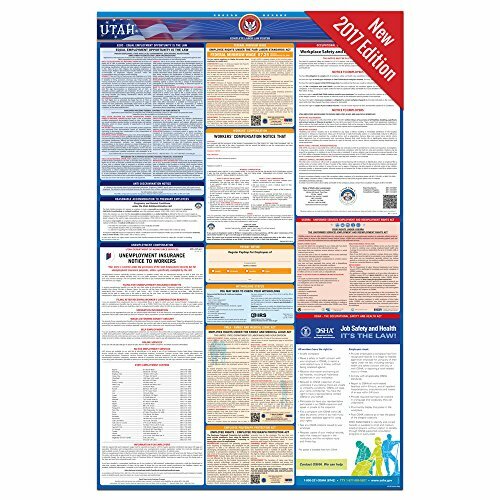 The New Jersey Federal and State labor law poster is a laminated, 24" x 40" option that satisfies the Federal and State posting requirements all in one handy wall hanging. New Jersey employers told us that this comprehensive labor poster provided a convenient and tidy means of displaying important information for NJ employees. The New Mexico Federal and State labor law poster is the update. 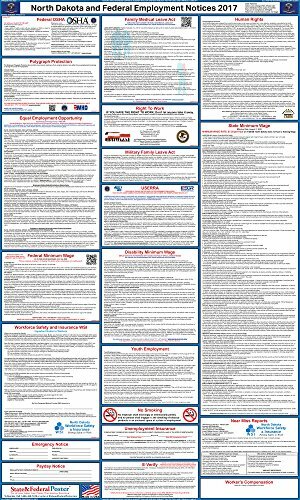 It is it laminated and measures 24" x 40", providing New Mexico business owners protection from labor disputes and lawsuits. The New York State Federal and State labor law poster is a laminated wall hanging that measures 24" x 40". It's lemonade it on either side, increasing its durability. New York small business owners we spoke to said that this is a comprehensive resource that provides all of the required information in a compact but readable way. 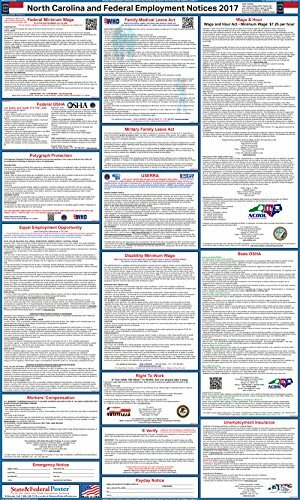 The North Carolina Federal and State labor law poster manufactured by Labor Law Posters is a laminated option that measures 24" x 40". The update includes all of the necessary revisions to both State and Federal law, helping to keep North Carolina business owners and employers safe from employee disputes and poster fines. 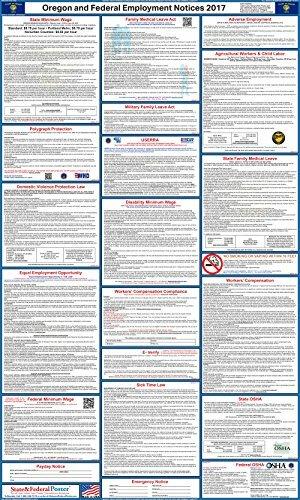 The North Dakota Federal and State labor law poster is a 24" x 40" wall hanging that provides business owners in the North Dakota area all of the regulatory information they need to post for their employees to remain in State and Federal compliance. 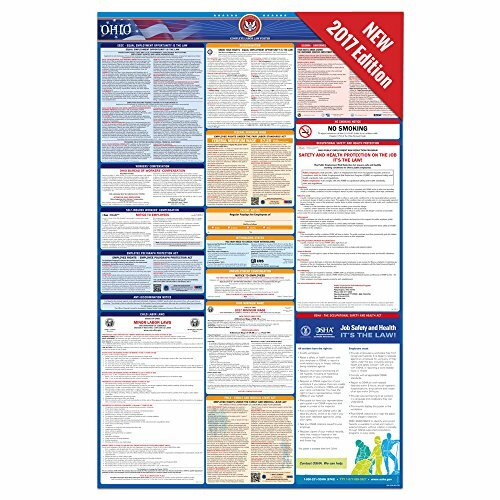 The Federal and State Ohio labor law poster is a 25" x 39" laminated option that spells out all of the regulatory information Ohio-area employers need to post in the workplace for their employees to see. The Oklahoma labor law poster is a update that contains Federal and State labor information, helping to safeguard employers from fines and lawsuits, while disseminating important information to employees. Labor Law Center Official, the manufacturers of this Oklahoma labor law poster, have had it vetted by Oklahoma-area attorneys and they guarantee that you will be in 100% compliance should you purchase their labor law poster. It's crucial to remember that you'll need to install more than one of these posters in your Oklahoma organization if you have multiple worksites- because employees need to have daily, visible access to this document to ensure that you remain in compliance. 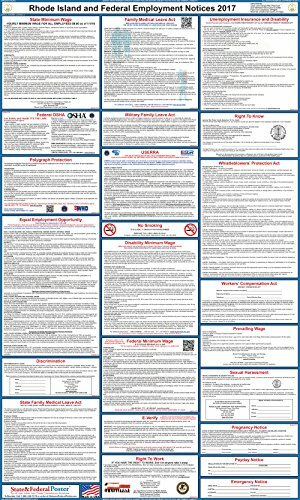 The Oregon Federal and State employee law poster is a 24" x 40" laminated wall hanging that provides Oregon area business owners protection from posting fines and employee disputes. It neatly and colorful provides all of the State and Federal labor law guidelines. You might want to purchase more than one if you have a decentralized Oregon business with multiple locations-because Federal and State law requires that employees have daily, visible access to this OR labor law poster. 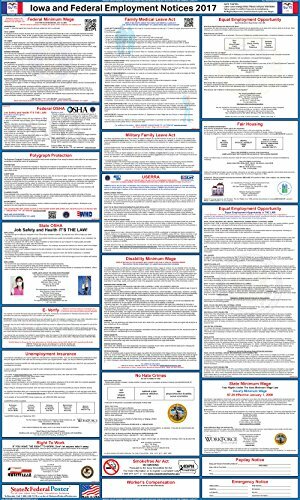 The Pennsylvania State and Federal employee lower posterior is a 24" x 40" laminated wall hanging that displays all of the required workforce law postings for Pennsylvania State and the Federal government. Pennsylvania reviewers we spoke with said that getting all of the legalese depicted in one tidy space was immeasurably preferable to printing out free resources from the PA State and Federal government- that would've been a messy disaster and impossible to manage. 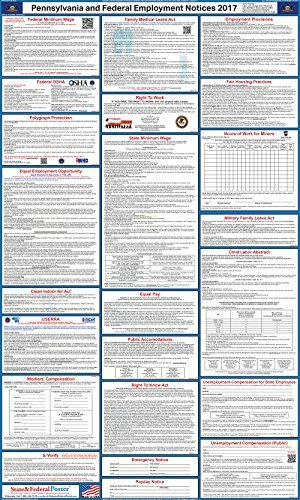 The Rhode Island Federal and State labor law poster is a laminated option that measures 24" x 40". 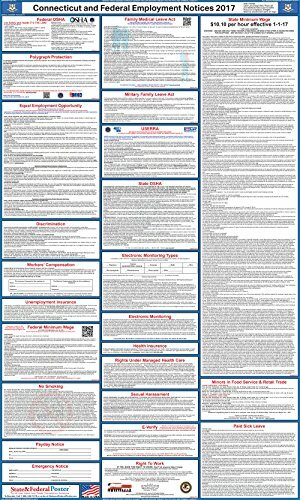 Some buyers were fairly surprised that the size of this employee wall poster, but with all of the Rhode Island State and Federal legal posting requirements crammed into it, it does have to be pretty large to accommodate all of that text. It will provide you complete compliance with the State and Federal labor law posting requirements, but you will need to be on the lookout whenever Rhode Island & Federal laws change so that you can purchase another RI poster to remain in compliance. The last thing you need is to get a fine- as these can be pretty excessive, running up to almost $33,000. 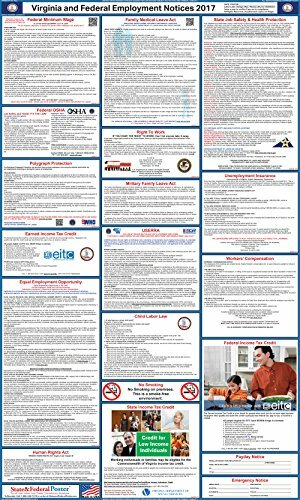 The South Carolina Federal and State labor law poster measures 24" x 40" and crams all of the required employee law info into one concise and tidy wall hanging to ensure that you don't incur any fines or suffer from employee labor disputes. It incorporates all of the recent Federal, as well as South Carolina-specific, revisions to national and State labor laws. One SC buyer we spoke with told us that in the past they had been in the habit of printing out free labor law information provided by State and Federal government resources, but it ended up being a huge, messy hassle. It's much more convenient and easy to manage across multiple South Carolina locations to just purchase one of these posters every year and distribute them to their different South Carolina business area locations. The South Dakota Federal and State employee law poster is a laminated wall hanging that measures 24" x 40". As with all of the other labor law posters we examined, it provides 100% compliance for South Dakota as well for Federal requirements. If you are ever in doubt about whether a poster contains all of the required information, you can always check with the Federal poster adviser resource and with your local South Dakota State Department of Labor. 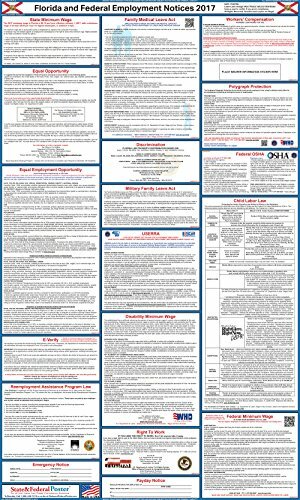 The Tennessee State and Federal labor law poster measures 24" x 40". It is a laminated option that can easily be displayed in employee lounges, in conference rooms, near doorway access to facilities- anywhere where your Tennessee employees will get daily access to this information. Supplying this important employee law information is crucial to remaining in compliance with Tennessee State and Federal agencies. 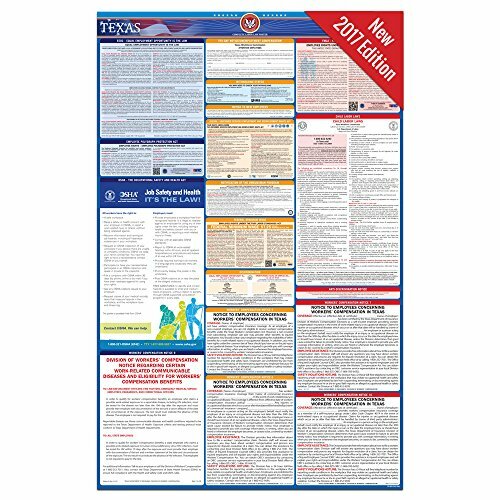 The Texas labor law poster is a Federal and State compliant laminated employee wall hanging designed to keep TX business owners free from posting fines and employee disputes. The manufacturers, Labor Law Center Official, guarantee that their Texas labor law posters are 100% compliant with Federal as well as Texas-specific employee law information. The Utah labor law poster is a Federal and State compliant laminated wall hanging that measures 25" x 39". It provides up-to-date and comprehensive information related to Utah and Federal labor laws. 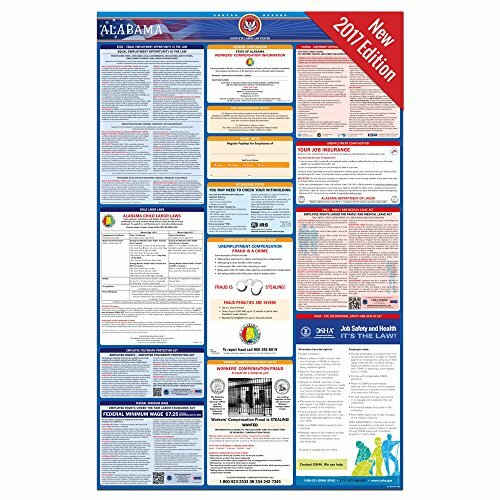 The Vermont labor law poster is a Federal and VT State compliant option that is guaranteed to be 100% compliant. It measures 25" x 39", is laminated, and provides business owners in Vermont all of the worker law regulatory information on one large, clean display. 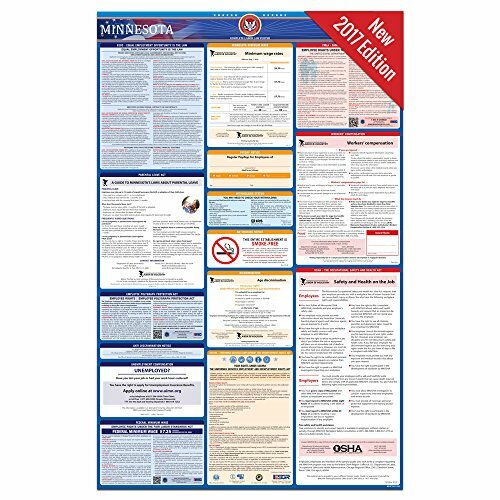 The Virginia Federal and State labor law poster measures 24" x 40", is laminated and provides up-to-date information regarding national employee law as well as for Virginia. This Virginia poster includes images, as well as text, which makes it much more inviting to read, rather than a forbidding wall of legal jargon that very few employees would ever venture to interpret. 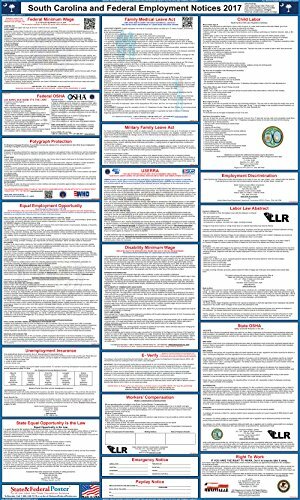 The Washington Federal and State labor law poster is an all in one resource that provides an English language compendium of employee labor law. It is a colorful option that includes some imagery which makes it easier to read should your employees be interested in acquainting themselves with their Federal and Washington-specific rights as workers. It covers issues specific to Washington State like Worker's Compensation, notice to employees, minimum wage, family leave, discrimination and your rights as a worker. One buyer we interviewed said that these posters are required by their in-house legal team and that they traditionally have been pretty pricey, but after doing some shopping online they realized that they are cheaper alternatives out there in purchasing through an expensive, approved vendor. 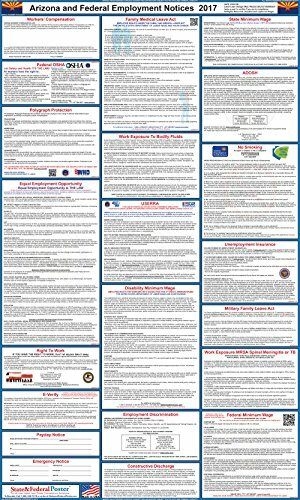 The West Virginia Federal and State labor law poster is a laminated, 24" x 48" option for West Virginia business owners. It lays out all of the Federal and West Virginia-specific labor law information for you to post prominently for your employees to see. It doesn't feature any imagery, which makes it a little bit less engaging to read, but the information is up-to-date, so if you are a West Virginia employer this is an easy and convenient way to get all of this information compactly displayed on your wall. This Wisconsin employee labor law poster is compliant with both federal and Wisconsin-specific posting requirements. 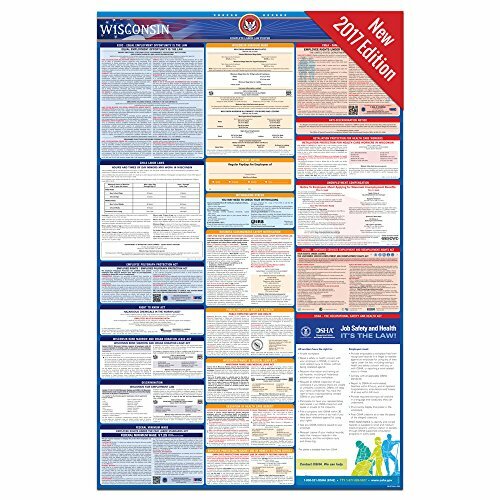 It is laminated and measures 25" x 39", providing and up-to-date resource for employee labor law information in Wisconsin. The Wyoming federal and state labor law poster is a laminated info graphic that measures 24" x 40", featuring some imagery, but mostly text. It will help to ensure that you are 100% compliant with supposed Wyoming specific employee law posting requirements as well as those of the federal government. There is a lot of confusion regarding these Federal & State employment law posting requirements. Specifically, who is required to post labor law posters? We defer to the comprehensive resource assembled by J.J. Keller & Associates. Having read through their information, we've assembled some tips and ideas for business-owners. In general, labor laws refer to working people and their employing organizations, which also includes trade unions and employee unions, and are enforced by government agencies. There are 2 different categories of labor laws- the first is collective and the second is individual. A collective labor law pertains to relationships between the employee, union and the organizational employer. Individual labor laws refer to concerns for an employees' rights in their workplace. These employment laws arose during the Industrial Revolution (Source). As a best practice, you should also display the employment law posters where job applicants can see them, not just your employees. When it comes to online job application portals, it's advisable to notify applicants that "applicants have rights under federal employment laws". You can then link that to the full text of the equal employment opportunity, employee polygraph protection and family and medical leave act. As we have mentioned earlier, if you have workers laboring at remote company locations, you will need to purchase more than one of these labor law posters, instead of attempting to photocopy, distribute digitally or just assemble the documentation in a portable binder. These labor law posters also need to be posted at construction sites, while electronic posters can be used for your company intranet. If you have any employee who travels, wherever they check in at those different company locations, those offices should be outfitted with these labor law posters. If they work from home, the employee should be mailed a paper copy of the labor law information. It's a good idea to display the posters in common areas- these include in the area where the majority of employees congregate like break rooms, lunchrooms, lounges, kitchens, conference rooms, or even near a time clock. You might need to fill in some information on these posters- things like an emergency phone number, Worker's Compensation policy info, and Payday information. According to J.J. Keller & Associates, if your business fails to post the required federal and state employment law notices they can be fined up to $32,946. In general, visa maximum finds only occur for employers that knowingly and continually violate posting requirements. While you can print these labor law posters for free from the government, this can be a tedious and time-consuming process. In addition, the labor law posters we examined above put all of the relevant information into one handy wall hanging. This is a simpler and more efficient means of displaying the necessary regulatory information as opposed to a variety of printed out material.